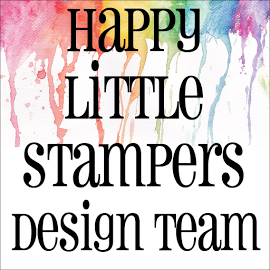 Today's card is again for the Happy Little Stampers CAS Challenge - Stamping as I wanted to get a last one in before closing! 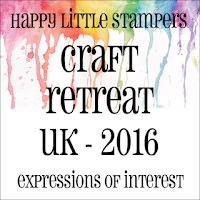 Also, if you didn't already know Kylie is organising a UK crafting retreat, if you are interested, pop on over, all the details are posted on the Happy Little Stampers blog. Anywho, this is my card today., which was very heavily influenced by a card I saw made in a video by the uber talented Jennifer McGuire . . . honestly, if you have never seen her work, where have you been? Just click on her name above to be taken to her blog and give yourself a real treat! 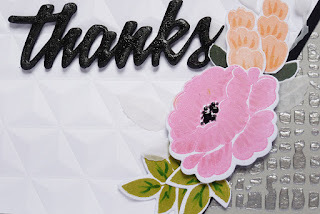 I first spread silver embossing paste through a Tim Holtz Layering Stencil on to a corner of grey card-stock, let it dry and flush mounted it on to a card base. Then I dry embossed a white panel with a We R Memory Keepers Embossing Folder and cut the corner off at an angle and stuck a snippet of black card-stock under the cut edge to finish it off and then mounted that on to the grey panel. Finally, I added some flower and leaves die cuts that I have had 'knocking about' in my craft room for ages and also a thanks die cut - also cut on another occasion - all these 'snippets' are from when I purchase a new die and try it out, I usually do not have a specific project in mind for them at the time, so they go into my little box and usually sit there forever! 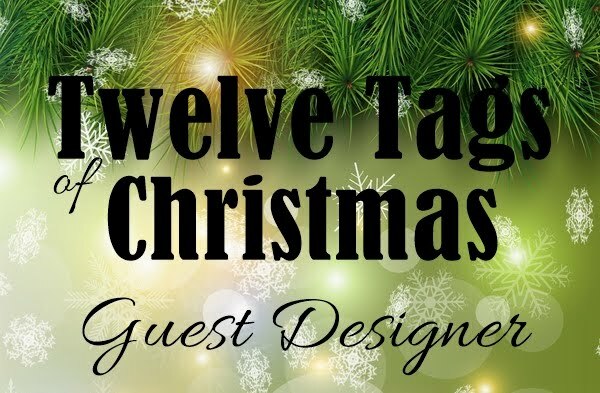 As it contains a lot of 'snippets' I also thought I would enter it in the Less Is More Challenge, which is for 'Snippets' I was also going to put it into 'Pixie's Snippets Playground', but am ashamed to say, I forgot how to use that Linky Widget over there . . . I've done it before, but I can't remember how? I finished of with some WOS, and Glossy Accents on the sentiment and WOS on the flowers. love the colors, design - everything about it - wonderful card Hazel! Really stunning card, Hazel! Love the layout with the stenciled corner! 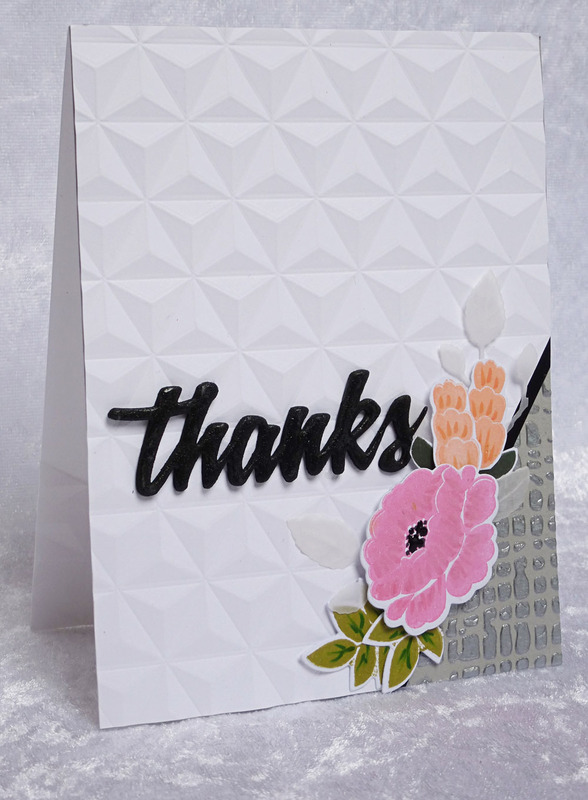 What a cool embossing folder and isn't it a great feeling to use some of the things that have been sitting on one's desk? Ooh! This is so pretty, Hazel! 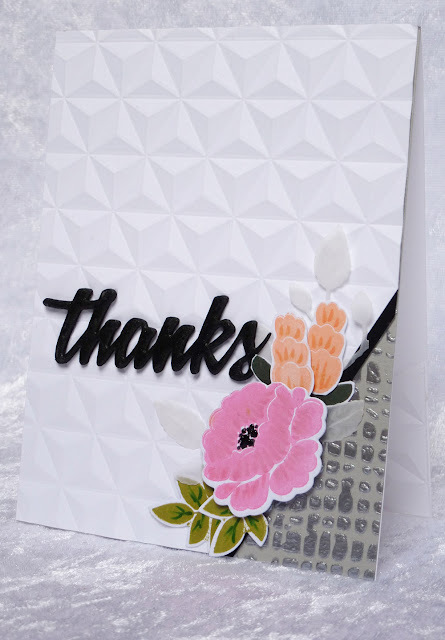 Love that geometric embossing and the silver stenciled piece! And those flowers are gorgeous, my friend! This is gorgeous, Hazel! The layout is fabulous and I love the texture you've got going on here. Wow, Hazel. 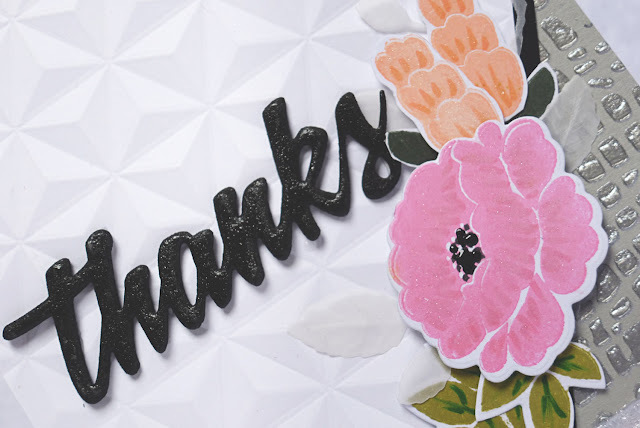 Such wonderful texture, colorful layered flowers and a bit of a sparkly sentiment. Three of my favorite things! WOW, Hazel!!!! STUNNING, my friend!!! Love the idea of having the corner in grey and the silver embossing really looks great!!!! The flowers are sooooo beautiful - love the colours - and the EF is just fabulous!!!! This is a masterpiece!!!! Beautiful!!! Love it!!! WOW! Simply AWESOME and oozing elegance here. 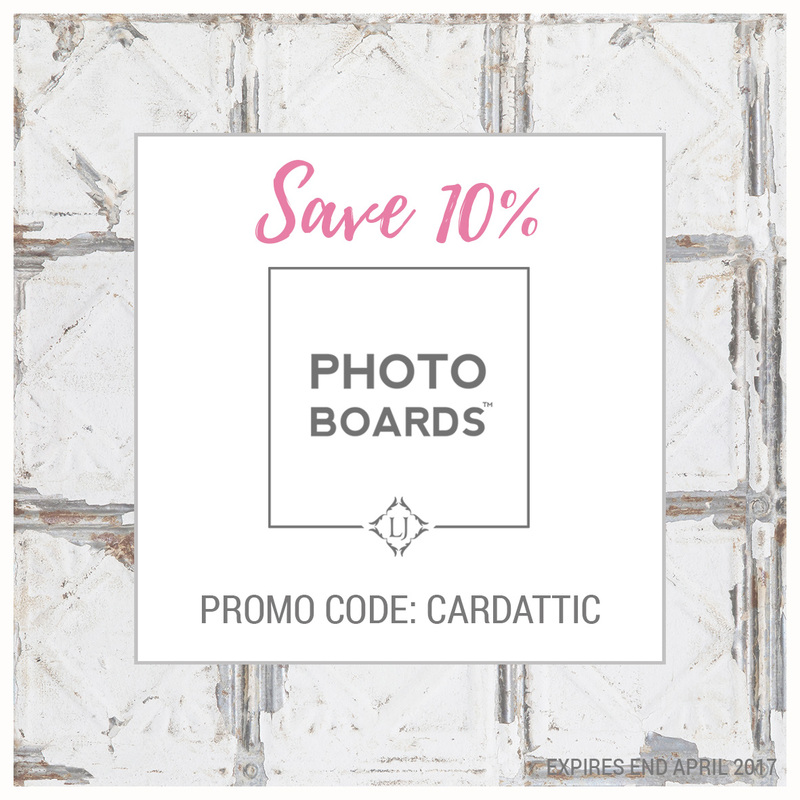 I'm loving that embossed BG and need that tool!!!! 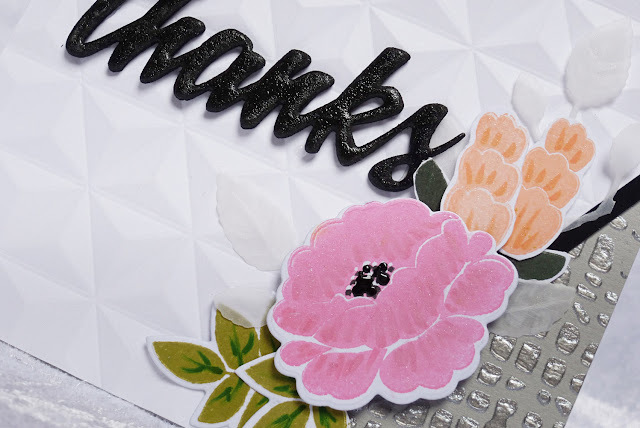 Gorgeous card Hazel...love your background is simply stunning and paired with your beautiful flowers makes for an over the top amazing card! That embossed background is quite fabulous! Stunning card, Hazel. I love that embossed panel and the stencilled corner is such a lovely touch. Thanks so much for linking up at Less is More. I saw this card all over pintrest,and I have to say it's A AZING! 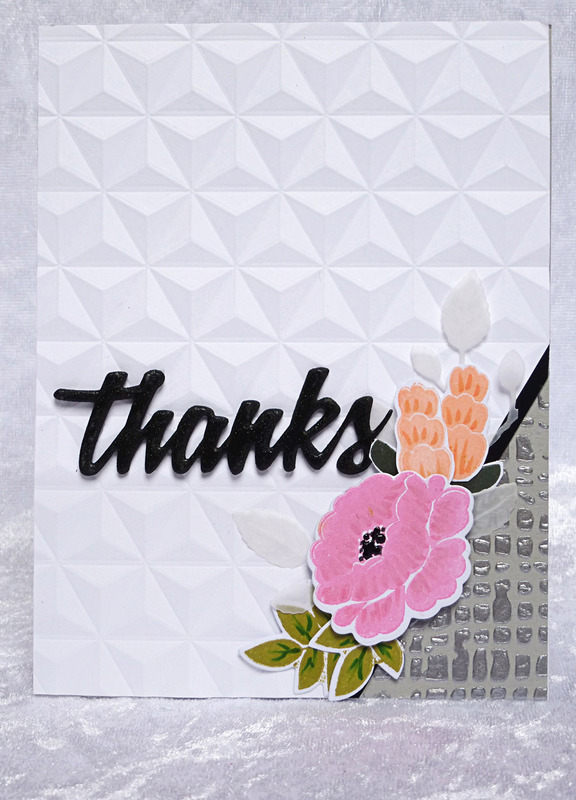 love the layers of texture,wow this is another showstopper ,Hazel! Winner for sure!